Though it’s hard to imagine, with winters icy grip, and its cold white coating of snow, just around the corner, for me when I think of renewal, I think of Spring. Spring is the time of renewal. Soon after the snow melts the wildflowers will begin to emerge and the young animals and birds will soon begin to be born. A new generation is about to commence. …to the Spring-time forest near you. Pink Lady among the birches. And soon there will be four. 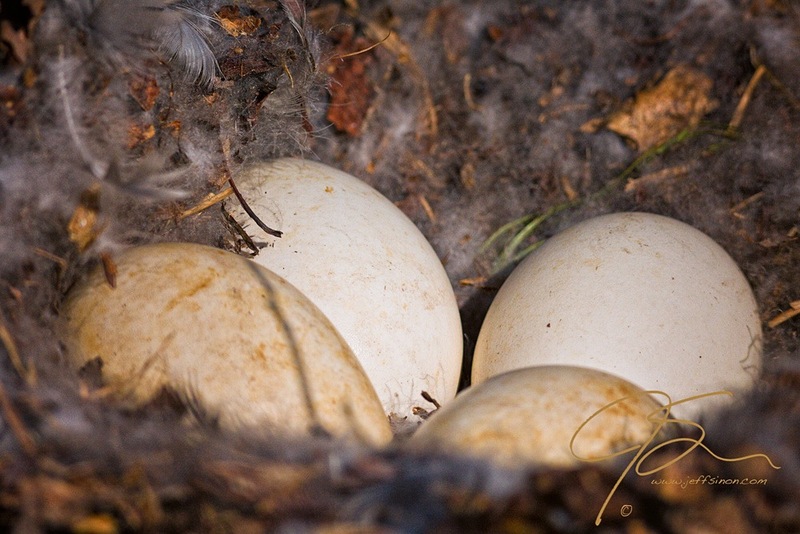 Canada goose eggs sitting safely in their down lined nest. 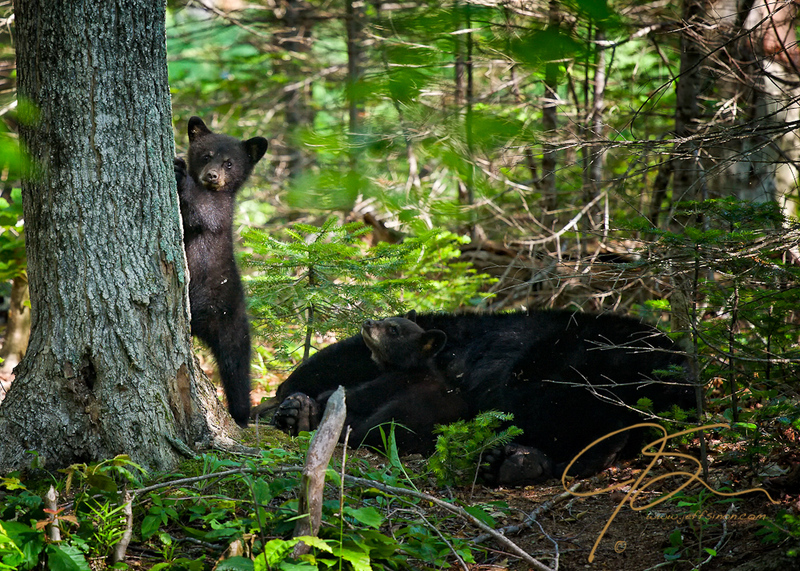 A pair of black bear cubs and their sleeping mother. Thanks Paul. They are one of my favorite, and therefore often photographed, wildflowers. these pictures are so beautiful and ,for lack of a better word, warm..
Nice shots Jeff. The texture in the flower in your first image is superb. Awww, the bear cubs are sooooooo cute. I just want to hug them and squeeze them – ok, maybe not when the mommy is around :). Fantastic photos!! All beautiful, but the one of goose eggs is a stand out and particularly apt. Thank you! I would have to agree, the eggs are the most fitting for this week. A great series of shots for this theme. Nice Work! Was Mama bear sleeping or “sleeping”? Cute babies though! As far as I could tell she was sleeping. When I first realized they were there, she appeared to be asleep. After a short while, she sat up, looked right at me (at least it seemed so), and then after a short while, lay back down. Which was a great load off my mind. If Mama was comfortable enough with my presence I figured I wasn’t going to become bear dinner 😉 I was able to photograph them for about 45 minutes before Mom got up and decided it was time to move on. Oh goodness, I think I would not have had the nerve to stay! Lucky you, both for running into the cubs, and also for the Mama deciding she was more interested in sleep than in lunch! Love the bears. As an Australian I find the idea of photographing bears a little terrifying! You must be very patient. The bear cubs are cute. Lucky you that you could have all that time to shoot them before Mama Bear decided to move on. 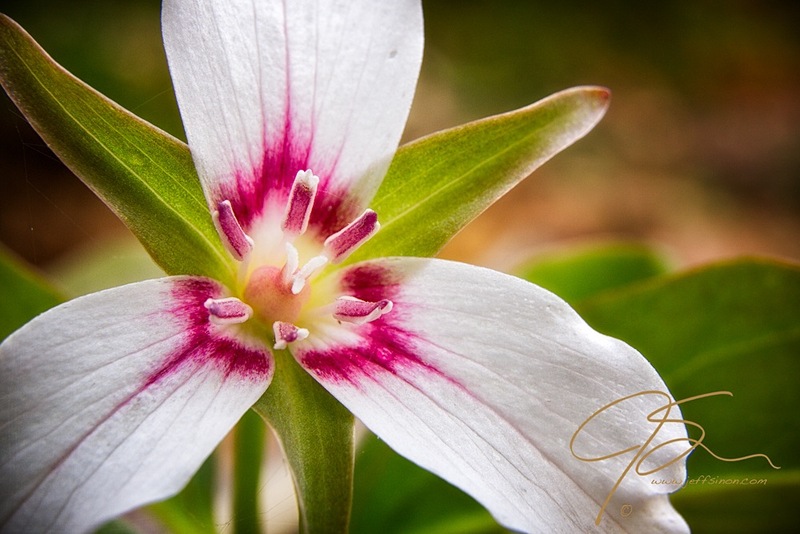 I really like the shot of the Painted Trillium — beautiful capture. I love those eggs …. BRILLIANT 😀 :D.
A terrific series of photos Jeff! Well captured first image (-: Nicely done. Thanks Rick. They are a great wildflower, and I have a few “secret” spots where there are a bunch of them. What lens did you use to shoot the black bears? How far away did you stay in order to get that shot safely. Thank you, but which one? 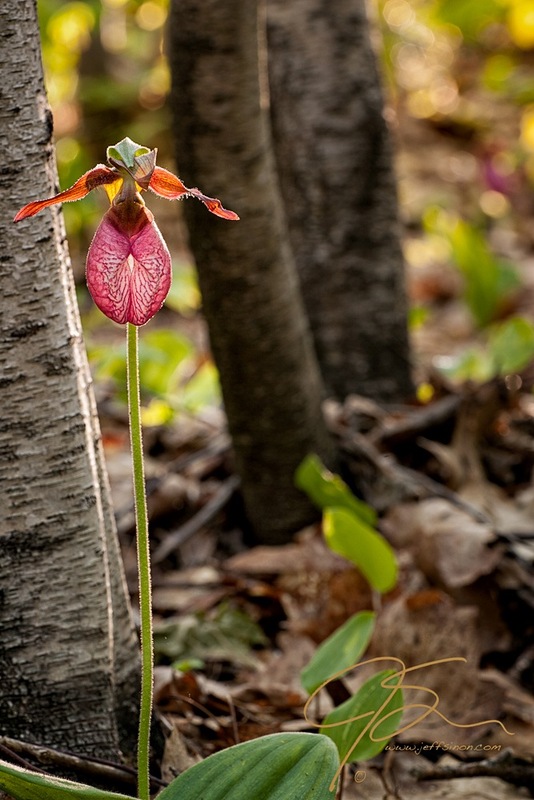 The painted trillium (first one), or the pink lady’s slipper? Thank you, one of my favorite wildflowers photographed in my own secret spot. Silly me, I thought you were referring to your local names for both flowers. Though “Nile Flower” sure makes more sense for a flower that grows on the water, rather than one that grows in the forest.